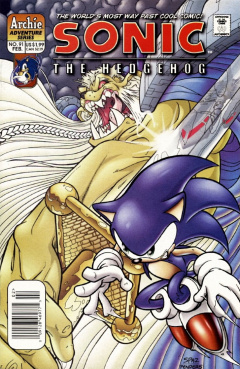 Sonic the Hedgehog 91 is the nintey-first issue of the Sonic the Hedgehog comic. It was released in February 2001. This comic features two stories: "CRASH!" and "A Knuckles Story". "After ten long years the iron-fisted rule of Doctor Robotnik over planet Mobius was believed to have finally ended! With the technological tyrant vanquished and his polluted factories shut down, order and beauty were restored to the city of Mobotropolis. Now the villain has returned to wreak havoc once more, but there are many who are willing to stand against him in the fight for freedom. The bravest among them is a brash, blue streak who just happens to be the fastest thing alive!" In the deserts of the Forbidden Zone, Rotor Walrus is walking back home to Knothlole, watching in awe as two meteorites strike Robotropolis but are deflected by its energy dome. From the distance an unfamiliar face approaches, calling out for Sonic. It's Mina Mongoose! Rotor and her are just getting acquainted when Sonic shows up and reveals how he burrowed himself to safety as the meteorites made their impact. In Doctor Robotnik's Base, Eggman is relishing in the apparent death of Sonic. He attempts to use the Sword of Acorns on Uncle Chuck to see if it actually restores a Mobian's free will. After the apparent failure of the sword to do so, Eggman contemplates slaying Chuck down, but decides that it would be ungratifying to do so without Sonic watching. In Knothole, Sally Acorn is asking Geoffrey St. John about how someone could have snuck past the royal guards and steal the Sword of Acorns. Geoffrey assures her that it was no simple thief, and that they solely sought the sword. Sally then enters the Medical Center of Knothole to visit her paralyzed father. There she encounters Nate Morgan visiting a wounded Max. At Doctor Quack's urging, the two to leave the center to accompany Queen Alicia Acorn. Back in the Forbidden Zone, Rotor is reminiscing about old times beating up Doctor Robotnik. Sonic elaborates on how this is not the same Doctor Robotnik, but an Eggman from another dimension that is ten times as evil. He urges Rotor and Mina to head back to Knothole while he presses on to retrieve the Sword of Acorns. Inside Robotnik's base, Arachnis swoops down from the ceiling to snag the sword, as Uncle Chuck watches in silence. As Arachnis makes her escape, Uncle Chuck mutters to Muttski about how they cannot yet reveal that they were freed of their mind-control when Eggman used the sword on them. Suddenly, Sonic appears on the screen, and they cheer him on quietly until hearing Eggman approach cursing the hedgehog. Eggman then plots to not utilize his Shadowbots on Sonic, but a contingent of Robians. Sonic approaches and is astonished to see the Shadowbots fleeing the scene. Back in Knothole, Sally and Nate Morgan are greeting Queen Acorn. Surmising that they all have some catching up to do with one another, Nate Morgan insists that the Acorns get to it straight away. Elsewhere, Rotor and Mina are steadily approaching Knothole, when they are spotted by someone who immediately alerts Geoffrey of Rotor's return.